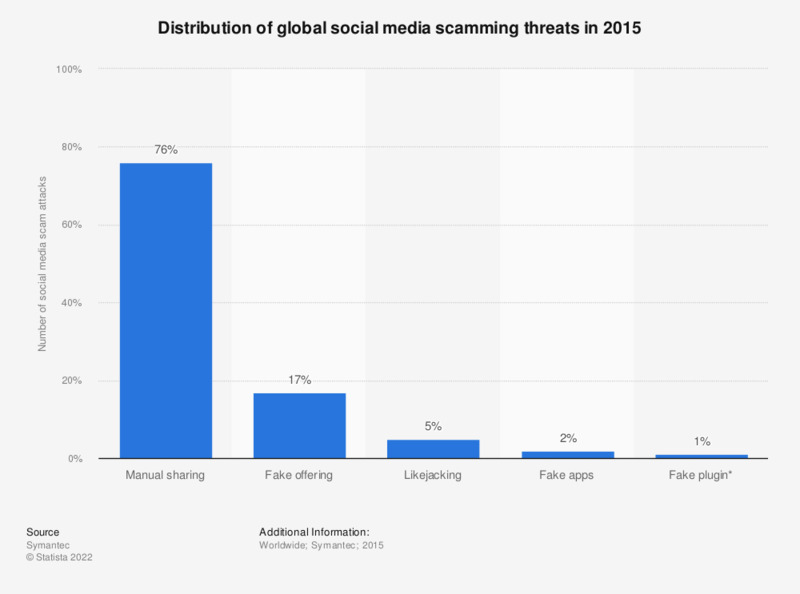 This statistic presents the distribution of global social media scamming threats in 2015. That year, 76 percent of social media threats required end users to propagate them. Fake offerings were ranked second with 17 percent of attacks being attributed to them. Fake offering: these scams invite social network users to join a fake event or group with incentives such as free gift cards. Joining often requires the user to share credentials with the attacker or send a text to a premium rate number. Likejacking: Using fake "like" buttons, attackers trick users into clicking website buttons that install malware and that may post updates on a user's newsfeed, spreading the attack. Fake apps: users are invited to subscribe to an application that appears to be integrated for use with a social network, but is not as described and may be used to steal credentials or harvest other personal data. Fake Plugin: users are invited to install a plugin to view a video, but the plugin is malicious and may spread by re-posting the fake video message to a victim’s profile page without permission. Examples include installing a fake YouTube premium browser extension to view the video, or noticing that a DivX plugin is required, and the fake plugin masquerades as such.